Carbon Dioxide - Welcome to the Paha Sapa Grotto! Carbon dioxide is by far the most important and fundamental of all the gases found in cave atmospheres. It is responsible for both the original formation of the cave’s open space and for the precipitation of the mineral formations that will in time refill them. Due to its genetic ties to the cave forming process, relatively high abundance in cave air and its rapid response to equilibrium shifts, carbon dioxide is an excellent tracer for the study of cave atmospheric dynamics. Cave-air CO2 concentrations are almost always considerably higher than the current 390 parts per million (ppm) atmospheric average. Cave-air CO2 levels are often observed to rise with increased distance from surface openings, as well. It is not uncommon for ambient CO2 levels to rise to several thousand ppm and more in some caves and several percent CO2, though rare, can occasionally be encountered in narrow enclosed spaces. At concentrations up to 2 %, very few effects other than a decrease in working capacity are experienced. When CO2 levels rise above 3 %, however, highly labored breathing and skin tone changes are the warning signs of approaching blackouts and possible asphyxia. Fortunately, extremely high CO2 levels are only very rarely encountered in caves, but it is good to be mindful of the possibility thereof, none-the-less. 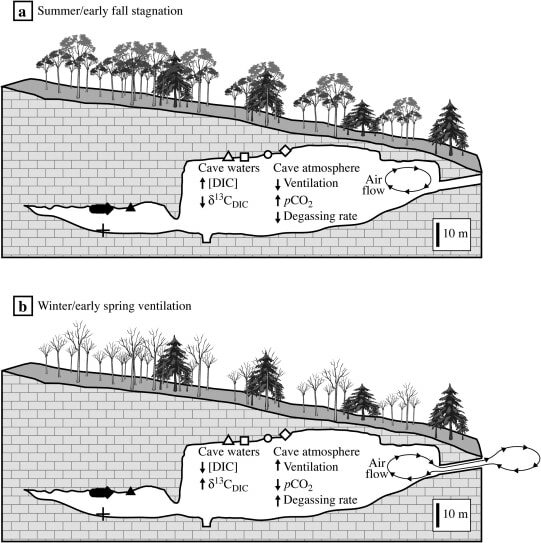 CO2 monitoring, if for no other reason than the recognition and avoidance of these rare situations, should be a consideration when entering newly discovered cave systems for the first time. Cave-air CO2 levels, at any concentration level, are directly related to the speleogenetic process and are strongly affected by both internal and external atmospheric dynamics. Cave atmospheric CO2 levels typically vary with temperature, the degree of surface air advection into the system, local groundwater chemistry and the CO2 gas content of the surrounding bedrock. Due to the combined influences of these factors, the carbon dioxide levels within a cave will typically follow a definite pattern of seasonal and diurnal fluctuation, with significantly higher inner atmospheric levels during the warmer times of the day and year and lower levels during the cooler periods. Dissolution mechanisms predominate during periods of high CO2 gas levels and precipitation typically takes place during periods of lower concentration, so these processes tend to follow the seasonal and diurnal patterns of CO2 fluctuation (see the section on reaction progress below). Gases in general have much higher solubilities in cold water than in warm water, and the advected warmer air during the summer months also helps to seasonally increase the CO2 and all the other trace gas contents of cave-air. The degree to which the gases present in the connected pore spaces of the surrounding formations controls gas levels within a cave are generally not well understood but are none-the-less likely to be significant. Formational CO2 and other gases typically migrate along faults, bedding planes and other discontinuities within bedrock, just as groundwater or any other fluid will, and these transported gases may (often?) constitute a major component in cave-air chemistry. The following two reaction series show the mechanisms responsible for cave dissolution and cave mineral precipitation, so they may be considered in light of how changing CO2 levels can affect the reaction progress in each cycle. In the world of chemistry, Le Chatelier’s principle dictates that if you increase one of the reactants on the left side of a reversible reaction at equilibrium , it will drive the balance towards the products on the right. On the other hand, if you increase the amount of one of the products instead, it will shift the reaction back towards the left. As a consequence, having a high and/or increasing CO2 level within a cave will tend to drive the reaction toward the right (product side) which favors the dissolution cycle, as outlined in the two linked reactions shown below. These same conditions will also simultaneously inhibit the precipitation cycle. This is because CO2 is one of the products on the right hand side of that reaction, so an increase in the CO2 level shifts the system back in the opposite direction towards the dissolved bicarbonate ion. This is illustrated in the precipitation reaction below. Le Chatelier’s principle similarly dictates that decreasing the amount of one of the products on the right hand side of a reversible reaction at equilibrium will have the same effect as increasing one of the reactants and shifts the reaction towards the products. Having a lower and/or decreasing CO2 level in a cave, therefore, will tend to favor the precipitation cycle and the growth of calcite and speleothems. Although the speleogenetic processes of dissolution and precipitation take place over a wide range of environmental conditions, there generally appears to be an upper limit of about 4000 ppm CO2 in cave air for calcite precipitation to take place. Cave systems with higher year around average concentrations than this threshold value tend to have speleothems that no longer grow, or to be devoid of speleothems entirely.